We finally got to the end of our sequence of interviews with the IMBER crew, closing it with a flourish. 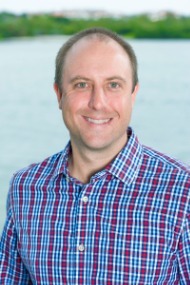 We had a quick chat with Dr. Paul Suprenand, an expert modeler working with the Ecopath family, who also integrates physiology and ecology to address challenges associated with environmental change, especially related to fisheries. Paul is currently a post-doctoral research fellow at MOTE, in Florida (USA). FEME: What are the advantages and disadvantages of modelling nature? PAUL: Nature is a very complex system, it has so many wonderful things to it, but in the model you cannot always capture all these little differences and they could be very important. So, the advantage would be that you have a way to look at some of the most important factors that could influence ecosystems or the animals within the ecosystem. However, you may lose some of the complexity. What is neat about the model is that it is more readily understood; you can ask questions or formulate hypotheses that could actually have some meaningful results to direct further research, or to help guide policies or ways in which you look at the system. So, overall, I think it is a pretty powerful tool, you have many different ways that the models can actually maybe capture some of the complexity lost in the individual model. FEME: What would be the next steps for the improvement of Ecopath with Ecosim (EwE) approach? PAUL: I think one of the neediest things is actually coming out, and it is something I had wanted for a long time. In the Ecospace portion of the modelling framework, there is now a way that you can start updating each of the individual maps for environmental drivers or things that may drive those trophic dynamics or energy exchanges in the ecosystem. For instance, in the artic or in the Antarctic, when you have sea ice coming into the ecosystem that is a very important part of how animals respond, their distribution, or whatever may occur. Historically in the ecospace system, you would have a static map, and so you could not see some of these differences of the environment drivers, like sea ice, overtime. Now there is a way that you can actually integrate or upload this data like the sea ice, so that when it changes you can also see the animal or food web responses as a whole. That is pretty cool, it is getting more into the complexity of the real life. FEME: What changes would you like to see in the scientific community? PAUL: I think we all have a need in our individual sciences to do more collaboration. Things like this [ClimEco Summer School], those workshops, are wonderful; you cannot reproduce them over emails, phone calls and the kind of relations you have here. However, I also think that us as individuals in the science, we have probably a greater opportunity these days to communicate our sciences, whether in social media or meetings on public libraries engaging the community in which we are living. I think it takes more these days to spread the science and the validity of science, or the things you know that essentially might get lost when you have translations in the news, when they say one result of science and they could be completely wrong in their interpretation. As scientists, we have a kind of obligation to make sure that we are reaching our communities, our audience, or our colleagues or hopefully the people who will be making decisions or people that you are living with, side by side; I think that would be important.